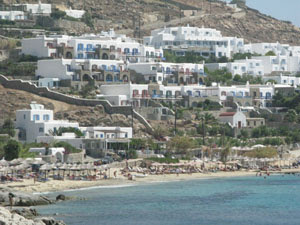 Mykonos, Greece entices visitors with old-world charm. 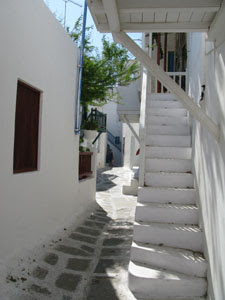 White stucco buildings are a hallmark of many Greek Isles like Mykonos. “I’d like tell you that I don’t always look like this, but I do,” said Amaryllis, our lovely 20-something guide on the Greek island of Mykonos, whose long dark hair kept whipping across her face. It didn’t take long to understand what she meant as we struggled to keep our own demeanor during gale-force gusts that blew almost constantly across the island. Still, wind from the Aegean Sea helps keep the climate moderate—and it adds a distinctive appeal to this old port town located five hours from Athens by ferry but only 40 minutes by plane. Tourists discovered Mykonos in the 1950s and 1960s and currently expand its population of 11,000 up to a million during the summer months. Yet it has steadfastly avoided common traps of overpopulated destinations. You’ll find no fast food restaurants, no Starbucks, not even a lighted sign on the island. Streets are narrow and curvy—to confuse pirates and protect homeowners in the old days—so it’s easy to lose your bearings. Since we opted for a guided walking tour, life-long resident Amaryllis (think Sophie in Mama Mia!) led us safely through the maze. Mykonos strikes a captivating scene with its closely spaced white-washed buildings, all sporting flat roofs—conditions originally meant to keep homes cool and clean but now required by law on all new construction. Shutters and doors are allowed to add specks of color, mostly blue and red. Ancient chapels and the Orthodox Christian Monastery founded in the 1500s are jewels of the island. Additionally, almost every family has a small private chapel dedicated to a specific saint. Families traditionally host large feasts and celebrations—open to the public--on their designated saint’s holy day. 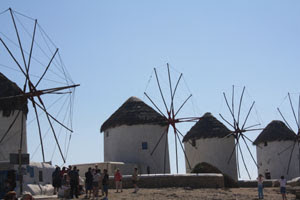 Old-fashioned windmills and Little Venice, a community built on the ocean’s edge, are other sites worth seeing. 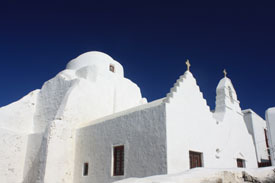 Churches are prominent on the island of Mykonos. With dry, windy, salt-infused air, the climate isn’t good for growing plants or animals, which means the economy depends on tourism—not difficult to achieve since the island is graced with beautiful scenery and numerous organized festivals. Southern beaches sport golden sand and crystal clear water, calm and sheltered from the winds. These may be family-oriented or cater to those looking for less--clothing optional. Gusty northern beaches tend to attract adventurous types like wind surfers or folks who prefer peaceful, unoccupied beaches. Plentiful quaint shops and restaurants accommodate tourists and have helped build the island’s reputation for nightlife and partying. Mykonos can be paradise whether you love soothing, old-world tradition or seek exciting contemporary fun.